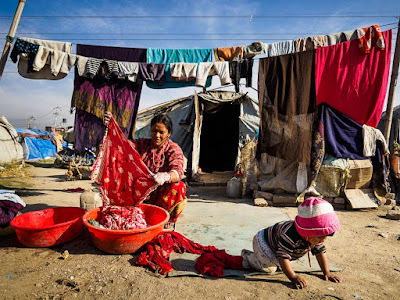 A woman left homeless by the 2015 Nepal earthquake does her laundry while her son plays in front of her. She lives in an IDP (Internal Displaced Person) camp in central Kathmandu. Her son was born in the camp and it's the only home he's ever known. 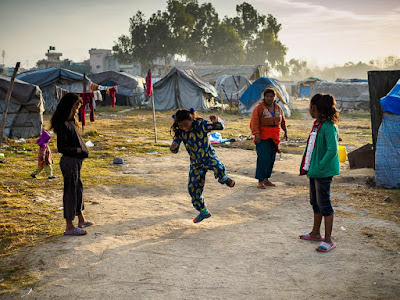 When I visited Kathmandu in the weeks after the 2015 earthquake I photographed a large IDP camp next to the Hyatt Regency Hotel. Thousands of people living in squalid conditions literally next to one of the most expensive hotels in town. The camp was set up in a large open field and given the nature of the emergency, it was understandable that the camp was created. When I was there in 2015, some 1500 families lived in the camp, most from villages in the mountains eight or nine hours from Kathmandu. Although there was no electricity in the camp, enterprising Nepalese found a way to tap into the grid and some of the tents had electric. Water was provided by NGOs who filled large bladders set up around the camp. NGOs also set up latrines on the edge of the camp. Life in the camp was difficult, but better than life in their destroyed villages. A woman sweeps out her tent in the camp. Her husband works at a chicken farm about 90 minutes from Kathmandu. He sleeps at the chicken farm most nights and only gets to the camp to see his family one day a week. I went back to the camp this week. I was a little surprised to see that, two years after the earthquake, the camp was still crowded with refugees from the earthquake. That better housing arrangements hadn't been found for the residents yet. I walked through the camp talking to residents (with the help of a translator) and I couldn't help but think the system had somehow failed them. 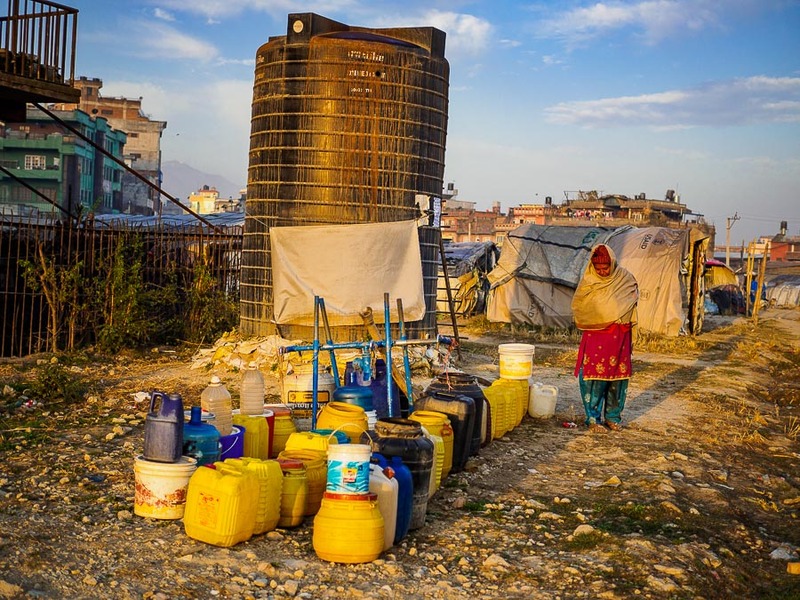 Although the population is down to about 400 families now (still over 1,000 people, Nepalese have large families), that it existed at all seems like a systemic failure. Children play a hopscotch type game early one morning. 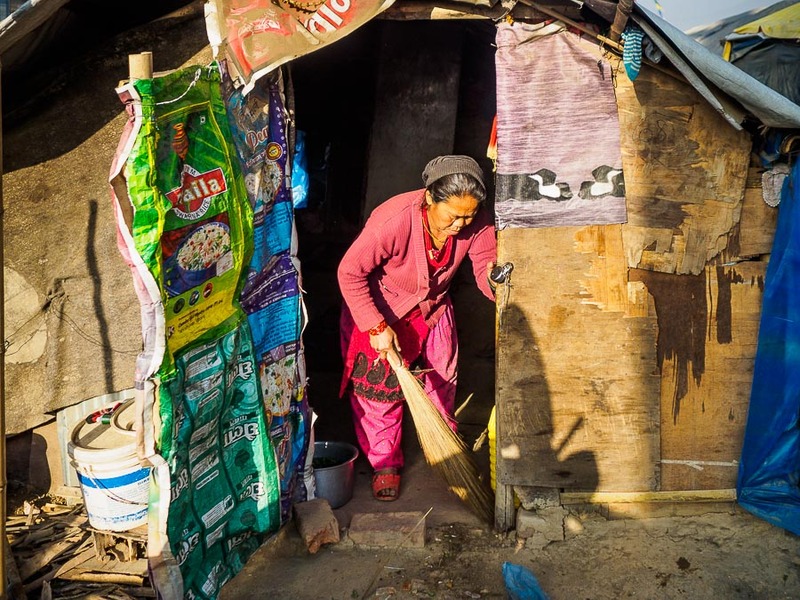 Many of the people in the camp have found jobs in Kathmandu's burgeoning construction sector. Rebuilding here is being done by hand, and the homeless people in the camp have been to work building new homes for the city's residents. Others work selling street food, like momos, or commute to work at jobs far from the city. Camp residents told me Kathmandu municipal authorities are trying to close the camp. Last week they stopped delivering water to the camp and now the only people who have water are those that can afford to buy it from vendors who deliver it in tanker trucks. Buckets set up at a water tank that has run dry. The buckets were removed later in the day when people learned the tank will no longer be filled. 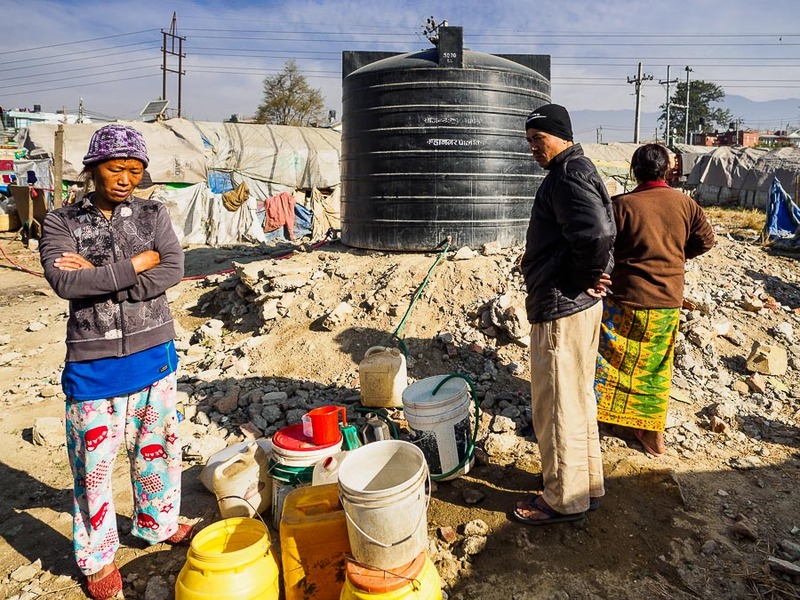 In another part of the camp residents fill their buckets with water they bought. The situation with the camp is not an easy one to resolve. It's not healthy for either the residents or Nepali society to have people living in such difficult circumstances in the middle of the city. Although there was water until recently, there was never any sort of a drainage system and domestic waste water ran in rivulets through the camp. Most of the tents don't have electric (the ones that do steal service from main lines) and none of them have heat. It gets cold in Kathmandu. Not Minneapolis cold, but lows in the low 40s to mid 30s (Fahrenheit) are not uncommon. That's cold when the only thing between you and the night air is a flimsy canvas wall or plastic tarp. A family warms themselves by a fire in front of their tent. Ten people live in the tent behind them. But I also don't think it's healthy for Nepali society if the government evicts them without providing an alternative. The people I talked to said they don't know what they will do if they have to leave. 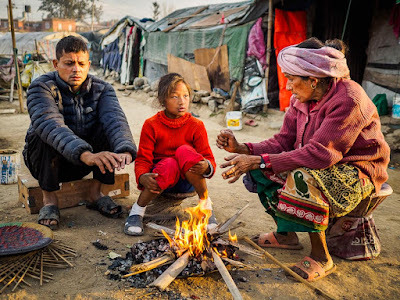 Most of them lost everything in the earthquake and they don't have the financial resources to get new homes in Kathmandu, which is already in the midst of an earthquake caused housing shortage. 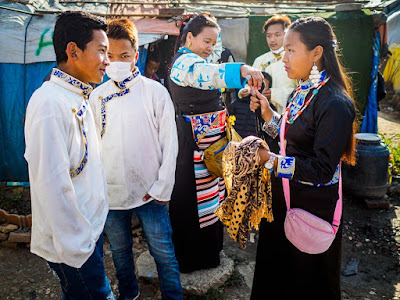 A Nepali Sherpa family dressed in their best get ready to go to a Tibetan New Year celebration at a Buddhist temple about 45 minutes from the camp. Residents said they haven't been given an exact deadline for being out of the camp, just that it's weeks, not months, away. It's another sign of how the earthquake has permanently altered Nepal. There are more photos of the IDP camp in my archive or available from ZUMA Press.